While the processes and media Lauren has used has been varied, the visual language and symbols have stayed consistent over time. Clouds, orbs, strings, pearl like forms, eggs and spheres set against deep layers have dominated the work. Lauren states “ I am looking to build and hide mark making by creating veils and a sense of history that is found in painting and by creating a visual dialogue between what can not be seen but can be felt. 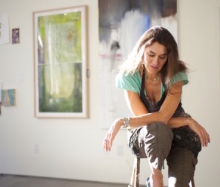 Lauren has exhibited her work extensively across the Western United States, as well as in New York and Mexico. She is a current recipient of The Lillian Orlowsky and William Freed Grant, 2015 and has been awarded numerous art residencies that include, Djerassi, Woodside CA, Santa Fe Art institute and The Helene Wurlitzer Foundation in Taos, NM. Lauren earned her MFA from Portland State University, in 1997 in which she began to deepen her focus on transcendence and beauty leading to a visual practice anchored in navigating the crossing points between the material world and the atmosphere of spirit. Lauren currently resides in New Mexico and teaches workshops on the creative process in art centers around the country and in her Santa Fe studio. "My friend Jens has no filter when speaking his brilliant mind. It’s a quality I admire, especially when discussing creative edges that push our limits and call out for personal growth. Recently Jens and I were in my Santa Fe studio. Large disheveled under-paintings I had just begun were leaning against the wall. Over worked paper pieces were scattered on the floor- in progress or abandoned? (it could go either way). They felt vulnerable, raw and not too sure of themselves. Jens was animated as he discussed his latest project of turning mud into functionality and grace. He had just bulldozed and excavated a cave on land he recently purchased on the outer borders of New Mexico into Arizona. He was making livable space. Art. I talked of mind clutter and the impatience /anxiety of feeling discomfort in visible vulnerability hovering around me. I mumbled something about re -creating what I had done in my last series. Exploring the tension points between the visible and unseen. Smokey clouded layers covering the ambivalence of life. I knew what he meant. I was at that edge believing painting existed in a realm that could be birthed like a machine. That was the truth -take the plunge of investigating the heart's longing in the now, or be an imitated version of myself set on automatic go. Zombie Formalism is what comes to mind. A term coined by artist and art critic Walter Robinson in 2014. My definition: production of abstract painting that is devoid of passion and more concerned with how it is made. Image, shape, color, singing together in a doable composition that is pleasing to the eye. Sometimes when hitting that uncomfortable edge, it’s tempting to go there. Production. The how to, neglecting the deep inner crevices inside ourselves that ask of us the why? needs creativity requires of us bridging mind to heart, a radical distrust can set in. For me- I usually need some space to become a bit untethered from daily left brain life. I guess my growing pains are asking of me to raise my frequency of light form the inside out. I still crave to paint just that. And when I am still enough to wait out the unlpleasantries of my mind I sometimes glimpse the realization that my vulnerabilities are my courage moved from the outside in, waiting to swallow beauty whole." 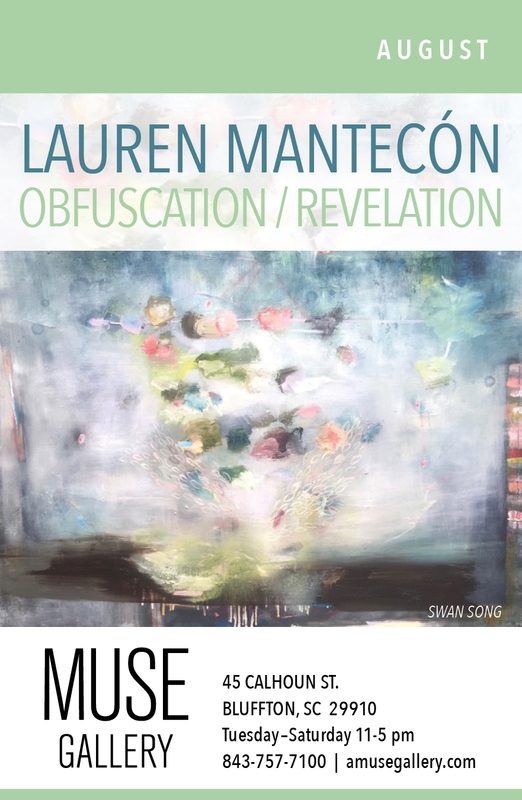 --a one person show of new work by Lauren Mantecon on display at Muse Gallery in Bluffton, SC through the month of August. Lauren Mantecon's mixed media paintings, pearl like forms, clouds, orbs, and featherly mururations are set against deep layers of color and surface texture. Mantecon builds up then veils her mark making with delicate glazing of paint, her layers alternate between obfuscation and revelation. Gallery hours are Tuesday- Saturday 11-5 pm or by appointment. There will be no reception for this show.